Three bedroom Two Bathroom Upper Level Condo located in the beautiful Abbey Springs Resort community. Recently updated throughout with a new kitchen, bathrooms and a sleeping loft/play area for the kids. 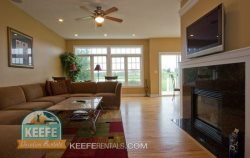 Enjoy your morning coffee or afternoon cocktail on the huge front deck over looking the golf course and pond while the kids play in the expansive yard. Enjoy all the amenities Abbey Springs has to offer including and indoor and outdoor pool, golf course, fitness center, lakefront beach, tennis courts and clubhouse. The perfect getaway for couples or a family to take in everything the Lake Geneva area has to offer.